Have you been to a service station lately? Unless you are part of the small cohort of electric vehicle devotees, then you are making regular visits to the fuel pump and shelling out a lot of cash in the process. While visiting the pump, you will find several grades of gasoline and in some cases diesel and biofuel options. Choosing the right fuel for your car can help it run its best while enabling you to avoid costly repairs as you keep your vehicle in sound operating condition. If you are not sure what type of fuel your car takes, there are two places where that information is prominently posted within your vehicle. The first is printed on its fuel cap. The second is in your owner’s manual. Carefully read what is published and understand the distinction between “recommended” and “required” fuels. Recommended fuels represent the grade of gasoline that your car is optimized to consume. Required fuels are those that you must use or risk damaging your engine and perhaps invalidating your new car warranty. Many high-performance engines equipped with turbochargers and superchargers require premium-grade gasoline only. Understand the distinction between “recommended” and “required” to avoid making a costly mistake. Engine damage can cost you thousands of dollars in repairs. Most fuel pumps offer two grades of gasoline, with others offering three or more. Regular grade gasoline typically comes in at 87 octane, with octane representing a flammable hydrocarbon liquid. An octane rating measures a particular fuel’s propensity to ping or knock when mixed with air and burned within an engine’s cylinders. To avoid knocking, especially in higher compression ratio engines, manufacturers may recommend or require that you use mid-grade gasoline (89 or 90 octane) or premium grade gasoline (usually 92 or 93 octane). There is, however, usually no performance advantage for fueling with a higher grade gasoline than for regular if your car is optimized to take lower octane rated fuel. Just as the octane rating measures gasoline’s quality of ignition, cetane measures diesel fuel. However, the similarities end there as cetane measures ignition delay, the time between the start of fuel injection and the start of ignition. A higher cetane number means your diesel-powered vehicle will start faster, operate quieter, run more efficiently and emit lower levels of pollutants. Unlike gasoline, motorists will typically find just one diesel choice at service stations. Cetane ratings typically range from 40 to 45 and in some cases as high as 55. Many service stations around the country carry biofuels. In fact, if you fill your car with gasoline, there is a significant likelihood that your fuel contains up to 10 percent ethyl alcohol. This should be of little concern for you as today’s gasoline-powered vehicles can run safely on a small blend of gasoline and ethanol, the latter typically derived from corn and other plant-based materials. Some cars are known as flex-fuel vehicles (FFVs), which means they can take either straight gasoline or a combination of gasoline and ethyl alcohol up to 85 percent. So-called E85 fuel or ethanol consists of 85 percent ethyl alcohol and 15 percent gasoline. Similarly, many of today’s diesel engines can take biodiesel, representing a combination of animal fats, cooking oil or soybean oil and straight diesel, ranging from 5 to 20 percent. Thus, B20 fuel represents 20 percent biodiesel and 80 percent petroleum diesel. A select number of vehicles can run on propane fuel or compressed natural gas (CNG), typically following aftermarket retrofits that make this possible. The advantage of both fuels is that they are cheaper and run cleaner than gasoline or diesel, but few service stations carry them. In areas where allowed, homeowners may install liquid petroleum (propane) tanks on their property. Homes equipped with a natural gas line can also install a compressor appliance to refuel their vehicles overnight. Not all models offer one fuel type only. Some are able to take gasoline, other diesel, while still others run on natural gas or liquid petroleum. When shopping for a new vehicle, consider the current costs for these fuels and plan your purchase accordingly. See Also — Is My Car E85 Capable? Is My Car E85 Capable? 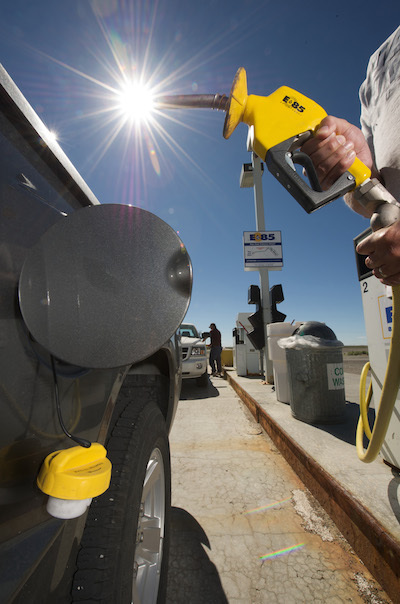 Ethanol-blended fuel is generally sold as E85, consisting of 85 percent ethanol and 15 percent straight gasoline. This particular fuel is usually derived from corn or some other grain, or by means of using other renewable or recyclable materials. E85 is relatively clean burning, provides more power to your car, but is less efficient than gasoline. Not all cars can run on E85, but yours might provided that at least one of the following three “clues” is in evidence. The most obvious indication that your car is E85 compatible is badging or other visible signage affixed to your car. Car manufacturers will often attach a badge stating “Flex Fuel” or “E85 Ethanol” somewhere on the body’s surface, usually at the rear or on the sides of the car. Flex fuel means your car can run on straight gasoline or ethanol, signaling that the fuel system has upgraded plastic and rubber parts and a modified fuel sensor to detect the relative amount of ethanol to gasoline. With some flex-fuel vehicles, placarding is used to identify this capability. For instance, you may find a sticker affixed directly above the gas cap or inside the fuel door, indicating E85 compatibility. In addition, some manufacturers use bright yellow gas caps and inscribe E85/Gasoline on the cover of the cap to denote its flex-fuel capabilities. Your owner’s manual provides a wealth of information about your car. Turn to the section about fuel to learn what types of fuel are recommended for your car. If your car can take E85 fuel, that information will be clearly outlined in the manual. The most comprehensive list of flexible fuel vehicles listed online is tracked by the American Lung Association of the Upper Midwest’s “Clean Air Choice” website. This list is updated regularly and includes all models produced since 1995 when select Ford Taurus models were built with flex-fuel capabilities. Moreover, the ALA doesn’t identify affected sub-models, but they do indicate which vehicles offer an FFV option. 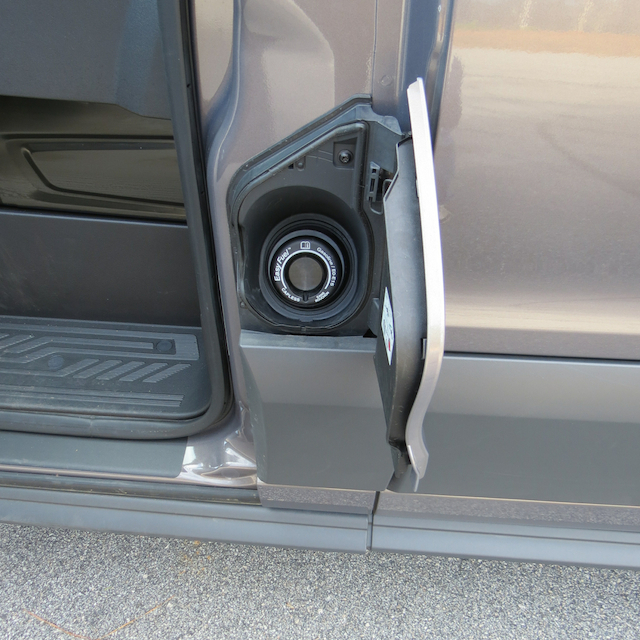 Your vehicle’s 17-digit vehicle identification number may indicate its flex-fuel capability if no evidence can be found on the exterior of your car or in the owner’s manual. The VIN can usually be found on the driver’s side of the dashboard at the base of the windshield and viewed from the outside of your vehicle. Each letter or digit also represents something about your vehicle including the year it was made, engine type, body style, country of origin and other factors. The eighth placement is reserved by some manufacturers, including Chrysler, to identify its flex-fuel capability. Jot down your entire VIN and contact your dealer to determine whether your car is flex-fuel ready. The federal government hasn’t instituted rules to identify E85 vehicles, leaving that responsibility to automotive manufacturers. Flex-fuel vehicles began entering the market in the mid-1990s, which means that the aged sedan you bought for your son or daughter may be flex-fuel capable without your knowledge. If in doubt about your car’s ethanol readiness, never use E85 as it can damage engine seals. E85 is also harder to find at service stations outside of the upper midwest and is up to 30 percent less fuel efficient than straight gasoline. See Also — How Can I Tell If My Car is Flex-Fuel Capable?